In the wake of the news about discharging 6% GST on prepaid reload cards, quickly rush to Digi website in order to make an online purchase of RM30 prepaid reload. Ironically, nthe counter is still charging the 6% GST. 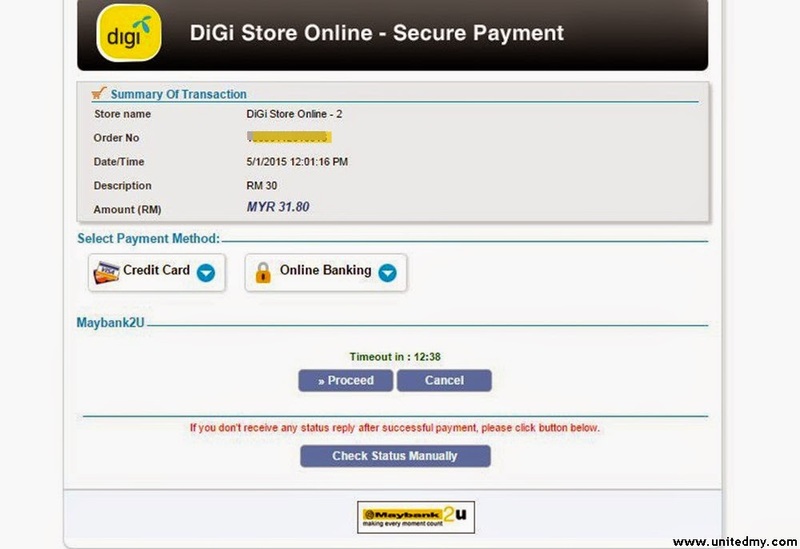 Without any thoughts cancelled the transaction immediately knowing that maybe Digi website is not updated swiftly. Trying to get the prepaid reload at Maybank2u website. However, Maybank2u declined offering its service to process Digi subscribers's need to buy prepaid reload. One can buy Digi mobile prepaid card via Maybank2u and many other mobile Internet brands such as Tunetalk or Celcom. The ultimate question is will authorities abolishing 6% GST in prepaid reload ? Hate to take the RM0.20 extra change when you pay RM32.00. Any Digi prepaid users should have RM30 in the account for 1.5GB Mobile Internet subscription. Reload is pretty much necessary imagine that failed to pay up the monthly fee of RM30 for Digi mobile Internet prepaid users, There will be no usage of mobile Internet. When one accidentally clicked "mobile data" in order to surf Youtube or E-mail, users are getting charge as per data used. The rate is so high could go up to RM8 for a day.